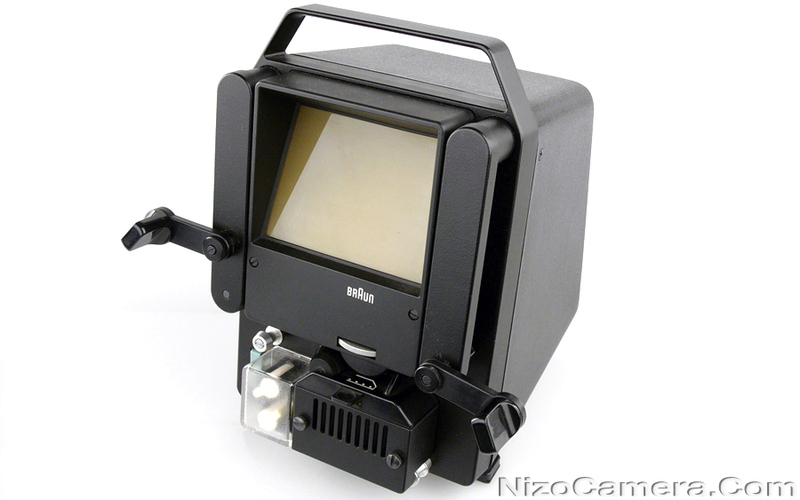 This Braun Nizo movie editor/viewer projects your film frames onto a 100 x 75 mm illuminated ground glass screen at any desired speed because it is manually controlled. Behind the screen there is a complete optical system with a 16 mm lens, twin lens condenser and silvered mirrors. The 6V/10W Halogen lamp is an exceptionally small, bright source of illumination with a long burning life and its colour temperature remains unchanged right up to the end. Your film is thus protected by low contact guide from which it can be effortlessy extracted for editing. You do not need a special rewinder because you can guide the film direct from reel to reel. The swivel reel arms accomodate reels up to 180m (~590ft) capacity. On both arms the friction can be set that the film does not sag and is accurately located by the guide rollers. To permit rapid winding or rewinding the left hand arm has a drive ratio of 1:2.5. Furthermore, you can run the film strip over two felt pads on the monitor - this will remove fingerprints, emulsion residues and dust. The frame can be focused on the ground glass screen. Can be operated with 220V only, certain countries will need an additional step-down voltage converter.